Kleefeld on Comics: On -isms: Better or Worse? G.B. Love was the driving force of comics fandom in South Florida and one of the main forces of comics fandom in its infancy. G.B. published The Rocket's Blast, a comics fanzine, in the early 1960s, which later merged with another fanzine to become The Rocket's Blast ComiCollector, known to most simply as the RBCC. The RBCC was an expensive ($5) magazine-size publication with fan (and future pro) art and articles and tons of ads from comics fans and dealers. 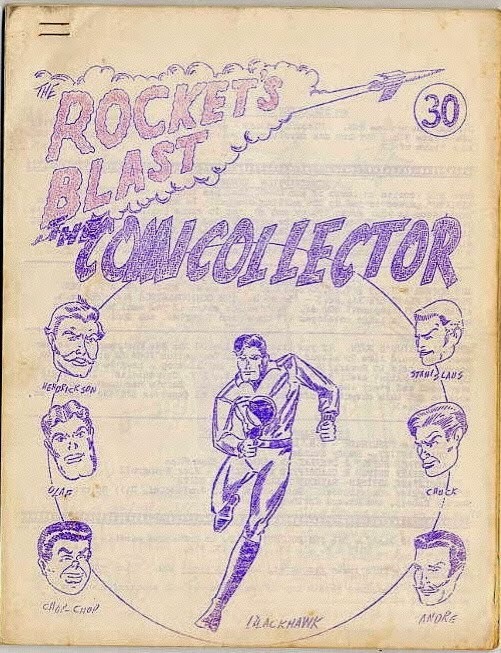 It was one of the first and largest forums for fans to buy and sell comics through the mail. This was in the days before comic stores and before The Buyer's Guide (later known as Comic Buyer's Guide) existed. Often, the only way for fans to get back issues was through ads in RBCC. The RBCC also showcased fan art and many whose work appeared within its pages often went on to professional comics careers. The RBCC was also an educational forum, with rich articles devoted to comics and creators long absent from the newsstands, such as EC Comics. If that were all that G.B. Love had done, he would definitely have earned his place in the annals of comics fandom, but he was also active on the local level. He organized the first comic book conventions in South Florida, beginning in the late 1960s in the unairconditioned Fireman's Hall in Coral Gables, and later at various American Legion Halls in Coconut Grove. "But, Sean," you ask, "isn't this one of your -isms posts? This sounds like it ought to be filed under your History pieces." You'll note that the I've included passage of the ADA in this list. Why is it relevent? Because Love had cerebal palsy. The fanzines, magazines and books he published, the conventions he organized and worked at, everything he is remembered for in fandom happened before passage of the ADA. It's worth noting, too, that his case of cerebal palsy was pretty extreme. His friend Earl Blair later said: "Walking was difficult as was merely picking up or handling a pencil... a Coke can... or just about any object. His speech was difficult and most folks would find nearly unintelligible." Keith Sillman mentioned that Love "couldn't really use his fingers, but he would sit at the admissions table and grasp the dollar bills with his gnarled hands. When he spoke, his speech was so badly affected that it often sounded more like seal utterances." Yet, by all accounts, he was a very successful writer/editor/publisher. In a time well before people with disabilities had a collective voice. When "handicapped" was a derogatory term. You might recall that even into the early 1990s, In Living Color felt comforable enough to regularly try to get laughs with Damon Wayans' Handi-Man character. Now, as I mentioned a few weeks back, some cons are going out of their way to ensure people with all sorts of disabilities are being treated well. So things are better, right? Well, that's hard to say. While we (or at least I) don't really hear any stories about bad experiences from people with disabilities, that could well be because they're superceded by sexual harassment of women. Or discrimination against racial minorities. Or any of the other issues that caused me to start an -isms column in the first place. I'd like to think things are better than they were in general -- I tend to view the past with whatever the opposite of rose-colored glasses are -- but the sparks of progress are frequently countered by increased reports of people being asshats. Love faced a challenging life and managed to succeed far beyond anyone's expectations. But that was in spite of the society he lived in, not because of it. After all, how many other examples like his can you point to in fandom. And while there still aren't people with disabilities crowding out others on the convention floor, I can see a greater number of them in attendance than even ten years ago. So that has to be some kind of progress... right?